This miniature place setting set for your 1:12 scale dollhouse is handcrafted ceramic. The miniature dishes set includes (4) 1" square dinner plates , (4) 0.75" dessert plates, (4) 0.42" tall mugs, (4) 1.52" wide fabric placemats & (4) napkins in decorative metal rings. 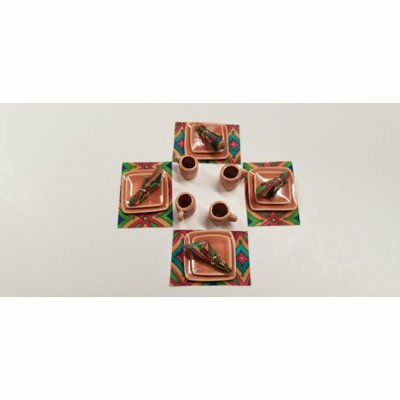 This 12 Piece Square Dinner Set - Indian Summer is supplied by Handcrafted Miniatures By Barb, which generally ships within 1 business day(s) of you placing your order .